[NEW] Added new "About Minion" window that lists all the software liceses Minion utilizes. Just press the (i) icon in the upper right. Thanks to loki42 for pointing out this was missing! [Updated] Removed blank Ad window. We don't plan on having Ads in Minion any more. [Notes] We are working on Minion 4 and there will likely only be emergancy releases for Minion 3 until Minion 4 is released. [NEW] You can now sort the auto update log under options. [NEW] Two new ways to clear your search: Press the Esc key, The spyglass icon turns into a clear button when you start typing. [FIXED] Linux Null pointer exception when starting up. Was missing game scan black list. [FIXED] Encoding issue with the config file under some languages. [FIXED] Right click ignore/un-ignore status icon. [FIXED] A few small bug fixes and optimizations. [FIXED] Emergancy fix for minion.log path. The Minion log file was being saved in the wrong location which was causing issues for some people. [NEW] You can finally rename your games in the game list. Just right click on the game name and a dialog will open allowing you to rename it. [NEW] Under the Installed AddOn list â€˜Ignore Updateâ€™ AddOns now show a stop icon to the right to indicate Minion is ignoring updates for that particular AddOn. [UPDATED] Minion will now record the data refresh time upon client startup along with the hourly refresh while the client is open. This can be seen in the Minion settings menu. [FIXED] Ignoring updates to an AddOn, then removing the ignore from options now works properly where you can re-ignore if you like. [FIXED] AddOns that are updated by author but arenâ€™t given a new version number no longer show up as a blank version in Minion. We now display the same version number in both the new and original if the AddOn version is not incremented by the author. [FIXED] Some small design issues. [NEW] Option to reset window position added to Minions system tray right click option (OSX option is in Minion left click Finder Icon). [UPDATED] Streamlined Minion 3 logging. The Minion log filename has changed to minion.log (no numbers). [NEW] Redesigned user interface. This new UI is cleaner, has more contrast, used more native os elements and is faster. All UI graphics are vectorized so it will look sharp even on 4k & Retina displays. [NEW] Backups for every one! 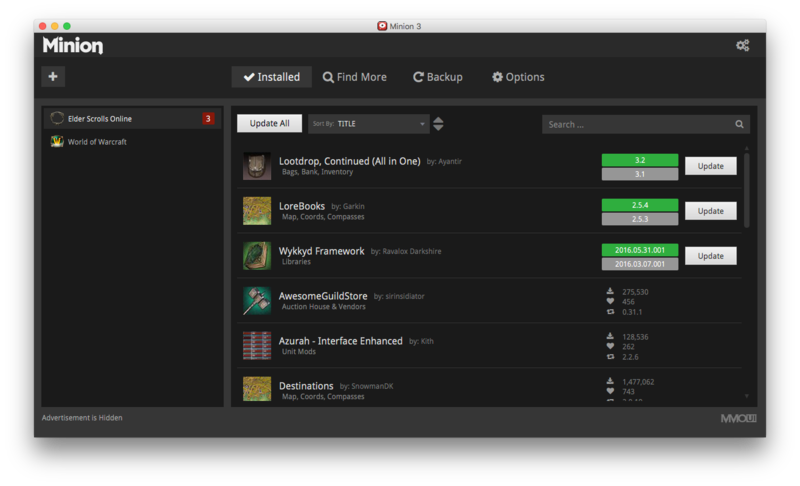 Check out the backup tab and backup your AddOns & Saved variables. [NEW] Specify a different location for your backups under settings (the cog icon in the upper right). Choose a location like another hard drive or even your Dropbox/Google Drive/OneDrive folder for extra backup security. [NEW] Native OS file/folder browser. [NEW] Native OS title bar/window and resizing. [NEW] Small advertisement to support Minion development. We have also included a button to disabled the Ad if it becomes too annoying. However it resets when you restart Minion. [Fixed] Wen't through and optimized Minion. We aren't finished but we have boosted performance a tad. [Fixed] Weird UI issue with updated a large amount of AddOns where the progress bars would flash around and display on other AddOns. [Fixed] Ignore Update now properly lists AddOn names under options with out restarting Minion. [Fixed] Clicking on the add game button multiple times will no longer spawn multiple add game windows. [Fixed] Manually adding a new game no longer ads the game multiple times to the game list. [Removed] The login system has been disabled temporarily. None of Minion features at the moment require an account. [Removed] All references to ZAM Network because we are Good Game Mods now. [Removed] Home tab. No one really visited this area of Minion and it was just taking up resources. [Updated] Minion version number is now displayed under the global settings window (click the cog icon in the upper right). [Updated] Lots of behind the scenes changes to help Minion grow in the future. [NEW] Mouse scrolling under "find more" and "installed" AddOn lists are much more fluid and we've added the ability to customize the setting under you Minion settings panel for windows only. [Fixed] Maximizing Minion on a 2nd monitor won't snap Minion back to the first Monitor. [Fixed] If Minion is in the system tray you can now use the application icon to open it again. [Fixed] Increased table cell size for auto-update log so text isn't cut off. [Fixed] Removed unused pre-loader. This may fix some junique bind issues. [Fixed] Other misc small bugs. [NEW] Shared libraries in bottom level directories will not be deleted if an AddOn is uninstalled and another AddOn still needs that library. [Fixed] Ignored AddOns needing updates would be sorted to the top under the installed tab. [Fixed] Clicking the global settings button opened multiple settings windows. [Fixed] AddOn details pane would not render if the image thumb data was missing. [NEW] : An auto-start with Windows option has been added to the Minion settings area. When this feature is enabled Minion will automatically start when you start Windows and will minimize to your system tray (next to the time). This feature only works with Windows at the moment. [Fixed] : Uninstalling an AddOn would delete the AddOn directly below in the list not the one you selected. [Fixed] : Minion hangs on startup during loading progress if an AddOn was removed or an AddOn folder was missing. This update is a patch release only. [New] : AddOns needing updates are now shown at the top of the installed list. [Fixed] : Memory issues when scrolling that would eventually cause Minion to crash. [Fixed] : Scrolling issue on the installed tab that would cause UI elements to display when they shouldn't. [Fixed] : Sort order button jumping 10px when toggling the button. [Fixed] : A few other small minor bugs. [New] : Minion upgraded to Java 8! This will require a client re-install and Minion will download and start the reinstall for you. 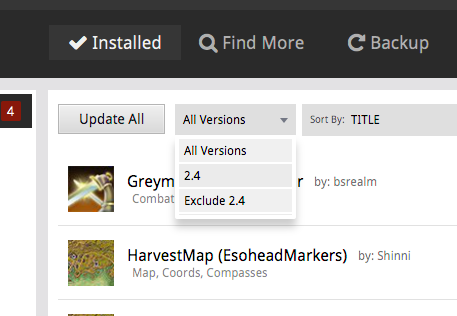 [New] : Filter AddOns by patch compatibility under the find more tab. [New] : Change the concurrent downloads under Minion settings. [New] : Change folder depth scan under Minion settings. [New] : Time of last data refresh displayed under Minion settings. [Updated] : A real version number is now displayed in the lower left of the client! [Updated] : Search is now much faster! It should no longer stutter as you type. [Updated] : Minion now only performs one scan to find all the games instead of a separate scan for each game. This should improve load times. [Updated] : If you choose to ignore a game Minion will not load resources for that game at the next restart. [Updated] : Minion on OS X will now minimize to the finder similar to how it works on Windows with the taskbar bar. [Removed] : Minion no longer requires the Microsoft Visual C++ 2010 Redistributable Package installed on windows systems. [NEW] : Backup AddOn setting (saved variables), Game Settings and take a snapshot of currently installed AddOns. This feature requires you to login with a ZAM Premium account or an AddOn author account. Remeber this is beta, you could stumble upon a bug! [NEW] : Minion will now ask you what hard drives you'd like to scan for new games. [NEW] : Global Settings window added allowing you to configure more settings in Minion and reset detected games, detected AddOns and hard drive permissions. [Updated] : Minion error logging is now easier to read. We also improved the amount of logging so we can catch more of these elusive bugs. [Updated] : During the game detection process Minion will not look in system folders or even the trash for games. This should increase the speed of game detection. [Updated] : More code optimizations. [Updated] : More error logging. [FIXED] : Pressing the maximize button doesn't require two clicks to un-maximize the window. [FIXED] : Minion should not crash when a bad path is entered manually for a game AddOn folder location. [FIXED] : Crash issue where Minion did not have write permission to the AddOn folder. [MISC] : Download link on website is now set to 32bit as default. [NEW] : Resizable main window! Drag the main window edges to make Minion the size you want or press the new maximize button. This required a major rework of the entire user interface. [NEW] : Minion now remembers desktop location and size. This information is stored in the minion config file if you need to reset it. [FIXED] : Fixed an error where Minion would display a "JavaFX Launcher Error". This was due to Minion not being able to bind to localhost so it can make sure only one instance of Minion is running. We have changed Minion to bind to 127.0.0.1 instead. Those experiencing this issue will need to download the latest version of Minion and re-install. [FIXED] : Added ability to skip network check in the minion config for those that have extremely high latency connections. [FIXED] : Issue where Minion would not even display the splash screen and exit immediately or display error. Users with this issue should remove/uninstall Minion 2.0.10 and download install 2.0.11 or later. If you are running 2.0.9 simply upgrading should be fine..
[FIXED] : Alignment issue with update version tags. [FIXED] : AddOn detection nullpointer issue causing Minion to hang forever on the loading screen. [FIXED] : Logging in or out of Minion would cause the "Installed" listview to go blank. [NEW] : Minion will now prompt you on startup for new game detection. If you don't have a game Minion is requesting to find just uncheck the game and check the "Remember settings" option and it will save you loading time. [FIXED] : World of Warcraft is now re-enabled in Minion. [NEW] : Minion now works with World of Warcraft! If you have WoW installed Minion should show the game on the game list with the detected AddOns. Temporarily disabled World of Warcraft support until detection issue is resolved. [NEW] : Minion will now auto refresh its data every hour. Enable auto-update under options and it will automatically update your AddOns as they are released. [NEW] : Update button now displays on the addon details pane & changelog pane. [NEW] : When an AddOn requires an update the previous and new version numbers are displayed next to each other. You can also click them to view the changelog (if available from the author). [NEW] : AddOn changelog is now viewable inside Minion if available from the author. [NEW] : Patch notes for Minion will now show in the client (you'll see them in the next patch). [NEW] : Minion now caches AddOn detection. This should speed up startup times after the initial detection. [Updated] : Major Improvements to AddOn detection. [Updated] : New tooltip design to better fit Minion. [Updated] : More detailed logging in the minion0.log so we can catch bugs easier. [Updated] : Removed featured / popular from home. They will be coming back in a better location soon! [Fixed] : Minion should now properly detect if Microsoft Visual C++ Redistributable 2010 (x64 & x86) is already installed. [Fixed] : Minion now checks to see if its already running and will open the currently running version instead of spawning another instance. [NEW] : Upon install of the latest version of Minion it will now check to make sure you have the proper Microsoft Redistributable installed. [NEW] : Minion now checks for an internet connection and displays an error explaining this. [NEW] : Added proxy controls to the minion.xml. Documentation on this will be coming soon(tm). [Fixed] : Found & Fixed a major issue with Windows AddOn detection. OSX was unaffected by this. [Fixed] : Load progress dialog does not always disappear even though Minion is fully loaded and working. [Fixed] : Possible fix for those getting the jvm.dll, Failed to launch JVM error. You will need to uninstall Microsoft Visual C++ Redistributable 2010 (x64 & x86) and also Minion. Then download the latest version of Minion and re-install. [NEW] : AddOn detection has been totally overhauled. Minion should now detect most if not all AddOns in the wild that are listed on our sites. [NEW] : Minion now does a sanity check on startup to make sure the installed addons are still there. So if you manually delete an AddOn folder it will no longer show up under Minion when you restart it. [NEW] : Uninstall script will now prompt you if you'd like to remove the minion configuration as well. You will need to re-install Minion to get the new uninstall script. [NEW] : Added tooltip to game names under the game list so if they are too long and get cut off you can still read the game name. [Fixed] : Auto-update now works! Enable it if you like under options and Minion will automatically update AddOns that need updating at start-up. [Fixed] : Minion will no longer hang if a bad or blank game path is entered and saved to the Minion config. [Fixed] : Minion adds addon paths using the same game-id in the new game detection system causing Minion to have issues when downloading AddOns. Users with this problem will want to delete their minion.xml again after the update. [Fixed] : Red AddOn update alert count box does not always show. [NEW] : Rebuilt ESO game detection. Minion should now automatically detect NA, EU & PTS and list them in the game list. You will need to delete your minion.xml to force Minion to redetect games if you want to use this. [NEW] : Sort by "Latest" under the Find More tab. List the New & updated AddOns first. [Fixed] : Version number now updates on download. This was to fix an issue where Minion had stale data when it downloads an updated addon. [Fixed] : Problems with unicode paths. Users that have non-english operating systems may need to uninstall Minion, download the latest version beta-2.0.9 and re-install. [Fixed] : Minion does not close files after extract. This caused ESO to not load some newely updated Addons when Minion was running. [Fixed] : (OSX) Minion would hang if you used Cntl-Q or closed Minion from the finder. There was also a bunch of refactoring and other small fixes. Special thanks to Iriel for some of the fixes! [Update] : Minion will add a version number to new minion.xml so Minion can detect what version of the config the user has and act upon that. [Emergancy Fix] : Fixed issue where Minion would hang if addon listed in minion.xml was no longer on the website database. [Fixed] : Minion will auto create the AddOn folder if was previously detected and its no longer there. The client will no longer hang. This should allow those that switch to EU in Elder Scrolls to switch their AddOn folder location and not have Minion hang. [Fixed] : Disabled blur effect and elipse animation on startup to save on CPU. It looked nice but not for the amount of resources it was taking on slower machines. [Fixed] : You can now isntall Minion in a location that has a space ("Program Files") and updates will work. If you currently have Minion installed in a folder that has a space you will need to un-install Minion and download the latest version and re-install. [Fixed] : Drive letters missing for file browser under Windows.